Citing sources familiar with the matter, Business Insider reports Amazon informed Nest in a conference call late last year that it would not sell the firm's newest products, which includes devices like the Nest Cam IQ and forthcoming Hello video-enabled doorbell. Amazon said the decision came "from the top" and had nothing to do with Nest's product quality, leading some Nest employees to speculate it was Amazon CEO Jeff Bezos who made the call, the report said. 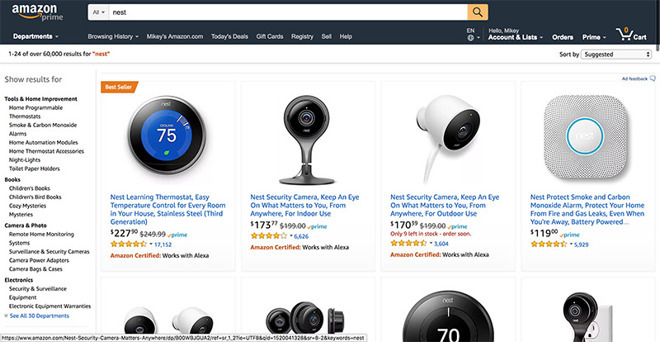 In response, Nest has resolved to discontinue dealings with Amazon, meaning currently available items like the Nest Security Camera and third-generation Nest Learning Thermostat will disappear from Amazon's digital shelves once existing stock runs dry. A source said Nest wants to present customers its entire lineup or nothing at all, the report said. The move comes as Amazon looks to leverage its prominent market position to push into the connected home space. Riding on a wave of success from its Alexa virtual assistant ecosystem, the e-commerce titan recently purchased connected doorbell and security device manufacturer Ring. Ring's Video Doorbell and outdoor Floodlight Cam both compete against products from Nest, though Amazon's decision does not smack of anticompetitive behavior. The online retailer currently sells a number of similar devices from various manufacturers. It is Amazon's ongoing battle with Google that might be to blame. Google this month announced plans to absorb Nest into its Google Home division, a strategy it says will "supercharge" Nest's mission to create a more "thoughtful" home. "By working together, we'll continue to combine hardware, software and services to create a home that's safer, friendlier to the environment, smarter and even helps you save money — built with Google's artificial intelligence and the Assistant at the core," Google SVP of Hardware Rick Osterloh said in a blog post. Amazon's Alexa and Echo series of speakers is challenged by Google Assistant and Google Home, which multiplied last year with the release of Google Home Mini and Google Home Max. In line with its recent decision to ban new Nest products from its site, Amazon does not carry Google's Home line, Chromecast hardware or Pixel smartphone. Likewise, Google in December blocked YouTube compatibility with Amazon's FireTV platform and Echo Show device. Amazon is in a precarious position as it both courts and competes with major tech companies. The firm had a similar tiff with Apple. In 2015, Amazon yanked Apple TV from availability, saying the device was removed because it did not "interact well" with Amazon Prime Video. At the time, the company refused to develop a Prime Video channel for Apple TV, assumedly due to Apple's mandated 30 percent cut of content sales. Most recently, however, Amazon reinstated sales of Apple TV in December and released a Prime Video app for tvOS. Today's report suggests the same thawing of relations could happen with Google, as Amazon plans to reboot Chromecast sales in the near future. Whether the olive branch is enough to get YouTube working on FireTV — and ultimately Nest products back on Amazon shelves — remains to be seen.